This weekend saw a brutal showdown between Liam Neeson, the current god of action cinema, and Jesus Christ, the current god of millions of human beings. 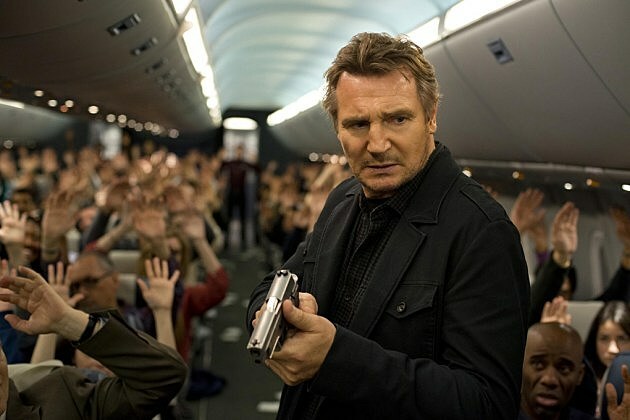 Since the box office is a “two may enter, but only one may leave” type showdown, the victory ultimately went to Neeson and ‘Non-Stop,’ which edged out the son of God and his movie, uh, ‘Son of God‘ to win the weekend. You’d think audiences would eventually tire of a large, 61 year-old Irishman growling his way through movies, but the man who was once Oskar Schindler is defying the odds, proving himself to be better at this senior citizen action hero gig than Sylvester Stallone and Arnold Schwarzenegger. Unless the audience totally drops off next week, ‘Non-Stop’ has a decent shot at a total gross of $80 million to 4100 million. While the Christian audience is large, powerful and totally capable of making this movie into a massive blockbuster, reactions from the faithful have been mixed. After all, this is essentially a recut version of a miniseries that ran on television and many viewers have felt ripped off. Next week will see whether the crowds rally in support of ‘Son of God’ or pull a St. Peter and deny it. Meanwhile, ‘The LEGO Movie‘ continued to perform spectacularly in third place, grossing $21 million for a $209 million total. At this rate, $250 million is a sure thing, with $300 million remaining a possibility if the film’s legs remain as strong as they are. After all, the film has barely dipped from week to week. It only needs a few more weeks of solid play. While we’re on the subject of successful animated movies, ‘Frozen‘ held strong at number eight, bringing its total to $388 million. However, the story today isn’t the film’s proximity to $400 million. The story is that it has now become the first Disney animated movie to cross $1 billion at the international box office. That’s a big, huge, crazy deal. The rest of the top 10 isn’t nearly as exciting. ‘The Monuments Men’ is still doing OK and will probably end up with a final gross of $80 million or so, ensuring that George Clooney gets to direct again. ‘3 Days to Kill’ took a huge spill in its second weekend, proving that Kevin Costner is no Liam Neeson when it comes to this action hero thing. ‘RoboCop’ is still a disappointment and ‘Pompeii’ is still a massive bomb. Finally, ‘About Last Night’ and ‘Ride Along’ are both about to exit the top 10 as hits, bringing Kevin Hart’s temporary dominance of the box office to a satisfying conclusion.